The fourth ”goodie” in September is program 26 in the Duke Ellington series broadcasted by the Danish Radio in the mid-1980s to the mid-1990s. The broadcast is available in the ”Goodies” section of the website. This program was broadcasted on July 19, 1985 and the announcer is Bjarne Busk. It combines a stockpile session from 1971 with excerpts from Ellington’s concert in the Coventry Cathedral February 21, 1966. The February 1-3, 1971 stockpile session features the singer Bobby Gordon in three number – Rocks In My Bed, Love You Madly and Looking For My Man. ”Not a very subtle singer”, one commentator has said but she certainly rocks with a strong bluesy feeling. She toured with Ellington for 15 months in 1971-1973 under her artistic name Nell Brookshire. The stockpile part of the broadcast ends with Peke – another groovy blues with Wild Bill Davis in a prominent role together with Ellington. Harold Ashby, Malcolm Taylor and Cootie Williams also solo. Peke was later issued by Storyville on the Togo Brava Suite CD. Next comes four selections from Coventry Cathedral – Come Easter, Tell Me It’s The Truth, West Indian Pancake and La Plus Belles Africaine. For those, who have not yet bought Storyville’s complete version of the concert, have now the opportunity to hear half of it. The broadcast ends with Ellington soloing on the piano in Japan in 1964. Bjarne Busk’s appeal to the listerners to help him to identify what Ellington is playing. It turned out to be an early version of something that later developed into Ad Lib on Nippon. In the Ellington discographies it is listed as Nagoya. Listen to the vibraphone player! 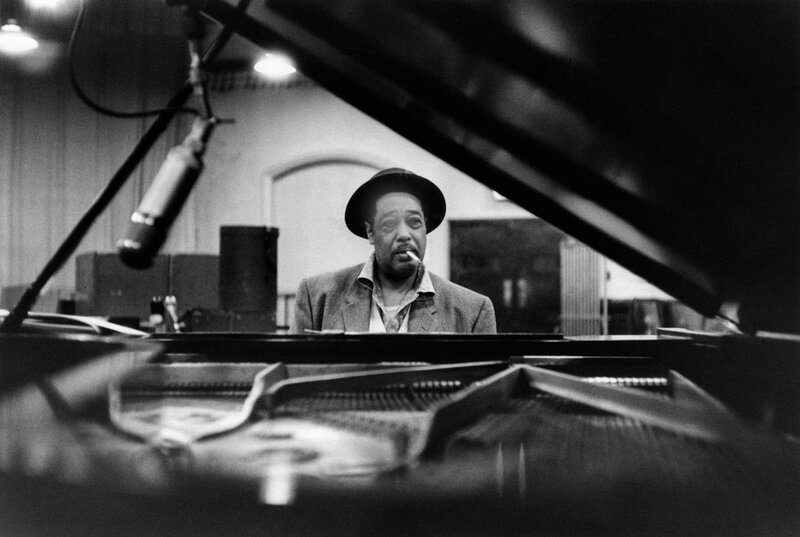 The decision by the Pulitzer Prize Advisory Board in May 1965 to reject the recommendation by its Music Jury that Duke Ellington should be awarded a Special Citation created an outcry in the music community and in civil rights circles. In the aftermath of this, the City of New York decided to confer on him its Bronze Medallion – the highest award it can give a civilian. Ellington received the award on August 2, 1965 at a reception in front of the New York City Hall. In an one and a half page article in the August 14 issue of The New Yorker, its jazz critic and columnist Whitney Balliett tells about the event. ”Many people of the jazz world and many city officials were on hand for the presentation.” Willis Conover, Nesuhi Ertegun (of Atlantic Records), Arthur Spingarn (President of the NAACP) were among them. Duke arrived with ”his wife, his sister Ruth and his nephew Stephen”. Before this Duke’s personal physician, Dr. Arthur Logan and the pianist Billy Taylor had made personal laudatory remarks and a band including Clark Terry, Billy Taylor, Jerome Richardson, Ben Tucker and Joe Benjamin had played some Ellington music. A five-piece Departement of Sanitation band had done this as well. The whole ceremony was recorded and can be heard below. Was it ”better late than never”? 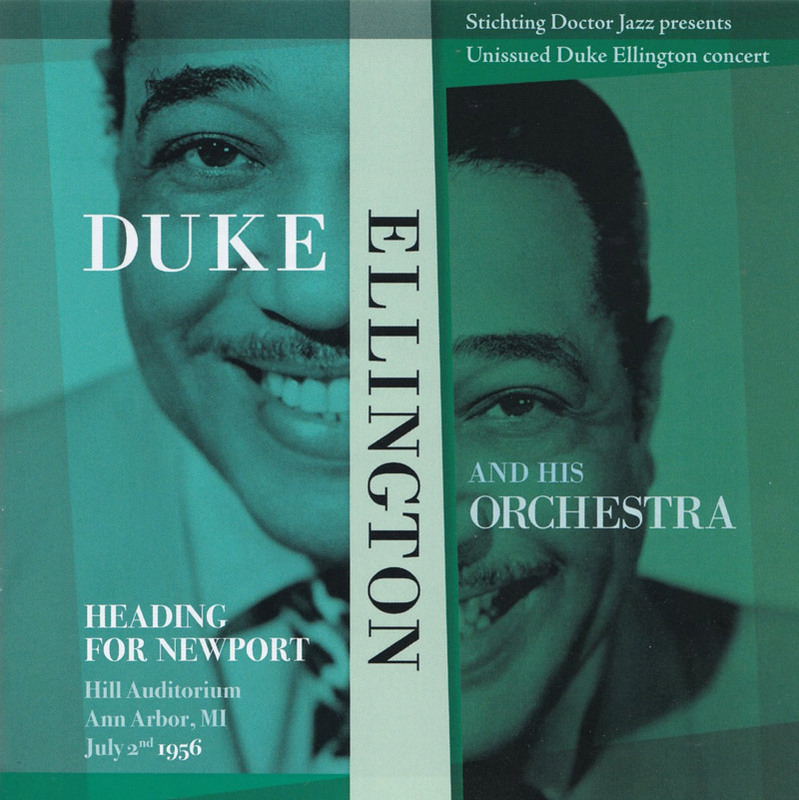 Stichting Doctor Jazz presents a previously unissued concert by Duke Ellington and his orchestra from the Hill Auditorium at Ann Arbor University in Michigan, dated 2 July, 1956. This happened just a few days before Duke and his men made their appearance at the famous Newport Festival. It is not, however, a rehearsal for that event, but rather an ordinary concert, with a repertoire reflecting what the band usually played at the time. What makes this recording unique is the very good sound quality achieved on this occasion. We also hear some outstanding solo performances, such as Clark Terry in Harlem Air Shaft, Jimmy Hamilton in Clarinet Melodrama, Britt Woodman in Theme For Trambeam, and Johnny Hodges in Prelude To A Kiss, just to mention a few. Steve Voce has written the interesting liner notes. Parts of this material was published on this web-site in August 2016 under the title ”Ann Arbor,2 juli 1956” (in Swedish). The CD can be ordered from http://www.doctorjazz.nl, e-mail: doctorjazz@online.nl If you do, you will not be disappointed. På den amerikanska radiostationen WBGO i Newark, New Jersey kunde man för ett par dagar sedan höra ett radioprogram med rubriken ”Hear the Earliest Surviving Radio Broadcast by Duke Ellington”. Det var jazzhistorikern, författaren och pianisten Lewis Porter som i sitt alltid intressant program Deep Dive tack vare tillmötesgående från Steven Lasker kunde låta sina lyssnarna höra 8 minuter av en radioutsändning från den 11 april 1932 med Duke Ellington. Den sändes från Publix Allyn Theatre i Hartford, Connecticut och sändningen som vi hör har bevarats tack vare att en man vid namn Larry Altpeter spelade in den i sitt vardagsrum med hjälp av en RCA Home Recording Electrola. Lasker, som är ägare av skivan sedan 1998, har hjälpt till med ljudrestaureringen. Merpareten av skivan är Ellington’s första framförande av ”When It Is Sleepy Time Down South” med Barney Bigard och Sonny Greer i ledande roller. Men vi får också höra temat från Lazy Rhapsody och en kortversion av Double Check Stomp. På webbplatsen http://www.wbgo.org/post/hear-earliest-surviving-radio-broadcast-duke-ellington-historic-find-deep-dive#stream/0 kan man höra radioutsändningen och läsa en utförlig artikel av Lewis Porter om den. Förre redaktören för DESS webbplats, Key Jigerström, har vänligen ställt sina kunskaper om hur man hittar information i gamla tidningar och tidskrifter till webbplatsens förfogande. Han har lusläst Stockholmspressen för dagarna runt Ellingtons spelning på Gröna Lund och har hittat lite intressant information. Både DN och Svenska Dagbladet innehöll naturligtvis annonser om evenemanget. Svenska Dagbladet uppmärksammade också att Ellingtons Sverigeturné hade börjat och Expressen skrev om Alice Babs’ gästvisit hos Ellington en av Gröna Lundskvällarna. Petter Himmelstrand i Expressen publicerade intervjuer med bl a Rolf Eric och Harry Carney. De kommer också att bli tillgängliga på webbplatsen. The autumn issue of DESUK’s Blue Light has now been published. The two main articles are about Ellington’s ”secret sessions” in Toronto in June 1972 and Jimmy Blanton celebrating the centenary of his birth. The first one is written by Jack Chambers and is an expanded version of the article published on the DESS website in June and August. The author of the Blanton article is written by the Blanton scholar (and much more) Matthias Heyman in collaboration with the DESUK editor Ian Bradley. Heyman presented his doctoral thesis on Blanton earlier this year. The article aims to ”demystify the many assumptions and unknowns that … surround young Jimmie’s life” and it does so very well. In the issue, Roger Boyes reviews the last two volumes of Storyville’s DETS series and this is another good read.